Alcide Charles Victor Marie Dessalines d'Orbigny was a French naturalist who made major contributions in many areas, including zoology, palaeontology, geology, archaeology and anthropology. The Aube is a river in France, a right tributary of the Seine. It is 248 kilometres (154 mi) long. The river gives its name to the Aube department. Foraminifera are members of a phylum or class of amoeboid protists characterized by streaming granular ectoplasm for catching food and other uses; and commonly an external shell of diverse forms and materials. Tests of chitin are believed to be the most primitive type. Most foraminifera are marine, the majority of which live on or within the seafloor sediment, while a smaller variety float in the water column at various depths. Fewer are known from freshwater or brackish conditions, and some very few (nonaquatic) soil species have been identified through molecular analysis of small subunit ribosomal DNA. Hedbergellidae is an extinct family of foraminifera belonging to the superfamily Rotaliporoidea and the suborder Globigerinina. The Albian is sometimes subdivided in Early/Lower, Middle and Late/Upper subages or substages. In western Europe, especially in the UK, a subdivision in two substages (Vraconian and Gaultian) is more often used. Phosphorite,phosphate rock or rock phosphate is a non-detrital sedimentary rock which contains high amounts of phosphate minerals. The phosphate content of phosphorite (or grade of phosphate rock) varies greatly, from 4% to 20% phosphorus pentoxide (P2O5). Marketed phosphate rock is enriched ("beneficiated") to at least 28%, often more than 30% P2O5. This occurs through washing, screening, de-liming, magnetic separation or flotation. By comparison, the average phosphorus content of sedimentary rocks is less than 0.2%. The phosphate is present as fluorapatite Ca5(PO4)3F typically in cryptocrystalline masses (grain sizes < 1 μm) referred to as collophane-sedimentary apatite deposits of uncertain origin. It is also present as hydroxyapatite Ca5(PO4)3OH or Ca10(PO4)6(OH)2, which is often dissolved from vertebrate bones and teeth, whereas fluorapatite can originate from hydrothermal veins. Other sources also include chemically dissolved phosphate minerals from igneous and metamorphic rocks. Phosphorite deposits often occur in extensive layers, which cumulatively cover tens of thousands of square kilometres of the Earth's crust. 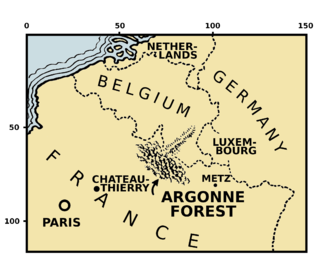 The Forest of Argonne is a long strip of rocky mountain and wild woodland in north-eastern France, three hours east of Paris, France. In 1792 Charles François Dumouriez outmaneuvered the invading forces of the Duke of Brunswick in the forest before the Battle of Valmy. China An early hadrosauroid iguanodont, about 17 – 20 feet (5 – 6 metres) in length. It had a narrow snout, an elongated lower jaw and double rows of flattened cheek teeth. It was a possible ancestor of the duck-billed dinosaurs. Egypt The only known bones of this sauropod were destroyed in World War II. Algeria The bones referred to "B." nougaredi probably belong to more than one different species. Aptian-early Albian Oklahoma This sauropod weighed up to 60 tonnes, making it one of the largest known dinosaurs. early Albian Tunisia Tataouinea had highly pneumatic pelvic bones, suggesting that sauropods had abdominal air sacs. The following is a list of Ammonite genera whose fossils are geochronologically found first in lower Albian strata. These genera may survive into later portions of the Albian stage, or even into later geological stages. This list should not be thought of in terms of the lifespan of the genera included. The following is a list of Ammonite genera whose fossils are geochronologically found first in middle Albian strata. These genera may survive into later portions of the Albian stage, or even into later geological stages. This list should not be thought of in terms of the lifespan of the genera included. The following is a list of Ammonite genera whose fossils are geochronologically found first in upper Albian strata. These genera may survive into later portions of the Albian stage, or even into later geological stages. This list should not be thought of in terms of the lifespan of the genera included. The Aalenian is a subdivision of the Middle Jurassic epoch/series of the geologic timescale that extends from about 174.1 Ma to about 170.3 Ma. It was preceded by the Toarcian and succeeded by the Bajocian. In the geologic timescale, the Anisian is the lower stage or earliest age of the Middle Triassic series or epoch and lasted from 247.2 million years ago until 242 million years ago. The Anisian age succeeds the Olenekian age and precedes the Ladinian age. The Aptian is an age in the geologic timescale or a stage in the stratigraphic column. It is a subdivision of the Early or Lower Cretaceous epoch or series and encompasses the time from 125.0 ± 1.0 Ma to 113.0 ± 1.0 Ma, approximately. The Aptian succeeds the Barremian and precedes the Albian, all part of the Lower/Early Cretaceous. The Carnian is the lowermost stage of the Upper Triassic series. It lasted from 237 to 227 million years ago (Ma). The Carnian is preceded by the Ladinian and is followed by the Norian. Its boundaries are not characterized by major extinctions or biotic turnovers, but a climatic event occurred during the Carnian and seems to be associated with important extinctions or biotic radiations. In the geologic timescale, the Olenekian is an age in the Early Triassic epoch or a stage in the Lower Triassic series. It spans the time between 251.2 Ma and 247.2 Ma. The Olenekian follows the Induan and is followed by the Anisian. ↑ Kennedy, J.W. ; Gale, A.S.; Huber, B.T. ; Petrizzo, M.R. ; Bown, P.; Jenkyns, H.C. (2017). "The Global Boundary Stratotype Section and Point (GSSP) for the base of the Albian Stage, of the Cretaceous, the Col de Pré-Guittard section, Arnayon, Drôme, France". Episodes. 40 (3): 177–188. doi:10.18814/epiiugs/2017/v40i3/017021. ↑ One or more of the preceding sentences incorporates text from a publication now in the public domain : Howe, John Allen (1911). "Albian". In Chisholm, Hugh. Encyclopædia Britannica . 1 (11th ed.). Cambridge University Press. p. 505.